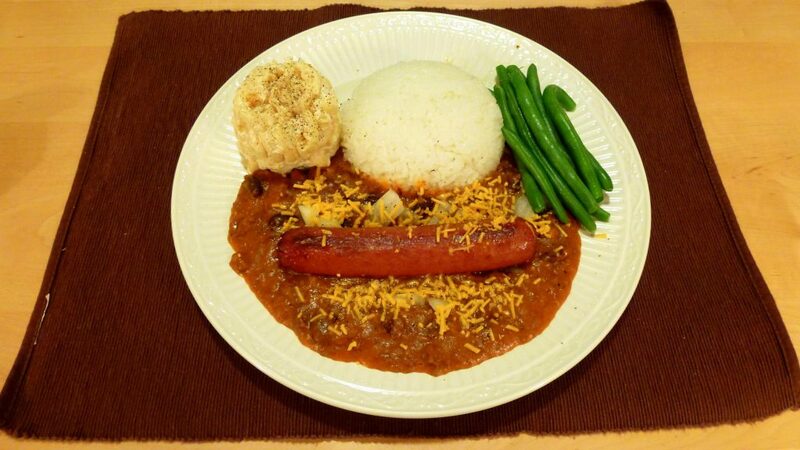 Eating Zippy’s chili at home. Want to Eat Like a Local in Hawaii? Traveling to the beautiful Aloha State on a well deserved Hawaii vacation? Want to immerse yourself into Hawaii’s lifestyle? If so there would be no better way to do this than to eat like a local in Hawaii. There’s no better way to start than with the ubiquitous Spam musubi. 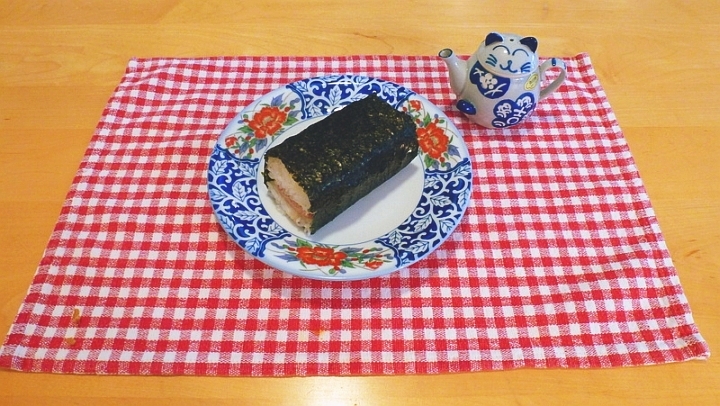 It’s a rectangular shaped mold of rice with a slice of fried Spam on top of it, wrapped with dried seaweed. You can find Spam musubis at most convenience stores or in many local fast food places. By now, most out of town folks may probably know about Spam musubis. This is because many nationally televised food shows have had shows on it. A bento is a pre-made Japanese meal, usually consisting of rice, fish or meat and pickled vegetables. And sellers typically package them in a rectangular tin foil plate with a see-through plastic cover on it. You can find bentos at many okazuyas or (Japanese styled delicatessens) along Waikiki or at food outlets in a number of major shopping centers. Even though they may be heated under a hot lamp for a while, they are still pretty tasty. They generally run around $7 to $8 each. Take it from someone who knows. That’s not so bad a price considering you’re in Hawaii. Plate lunch from Rainbow Drive-In. Consuming this is a sure fire way to eat like a local in Hawaii. And if you really want to be adventurous, then you definitely must try Hawaiian style plate lunches. You can get them at lunch wagons near the beaches. Try them at local drive inn chain like Zippy’s. Sample them at the iconic Rainbow Drive-In on Kapahulu Avenue. Or eat them at many fast food eateries throughout the state. You’ll have to ditch your Atkins diet for a while because you’ll be eating a lot of carbs. 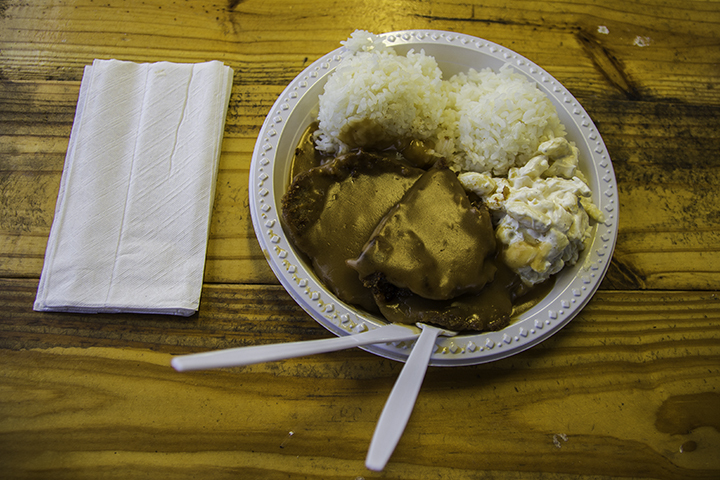 A typical plate lunch consists of the standard two scoops of rice, macaroni or potato salad, kim chee and some sort of meat topped off with gravy. You can also get plate lunches with chicken, chili, stew or fish as main dish. You can get Hawaiian food at many places that serve plate lunches. Or you can also get them in restaurant that specialize in them, like Ono’s Hawaiian Foods in Kapahulu or Helena’s in Kalihi. 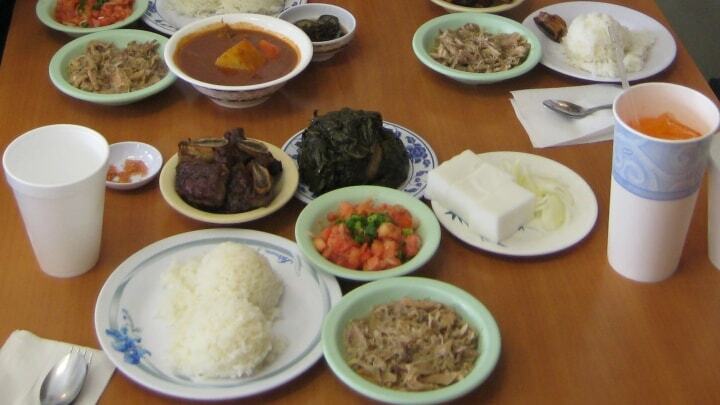 Some of standard Hawaiian food dishes include: kalua pig, laulau (pork or chicken steamed in a vegetable wrap), pipikaula (Hawaii’s version of pastrami), lomi salmon (salted salmon with onions and tomatoes) and poi. And of course, Panda Travel ®, Hawaii’s largest travel agency and travel wholesaler can take you to Hawaii at some of the best package deals that can be found on the Internet. We’ll save you some money on your travel so that you can spend your savings on some of the finest “local kine grinds” in the Hawaiian Islands.